Rosie the Riveter pays tribute to the women who worked in factories and shipyards during World War II. 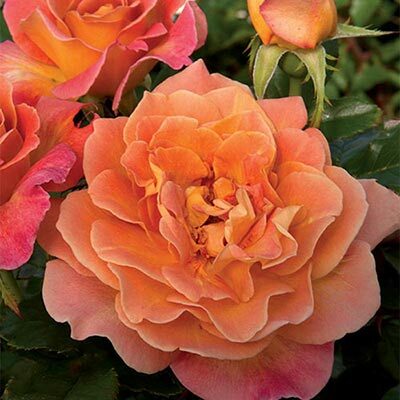 The old-fashioned unusual flowers of orange-gold suffused with pink are surely reminiscent of that era. The exquisite pointy and shapely buds are proudly held on top of very glossy dark foliage as a feminine symbol of charm and strength. The moderate fruity & spice fragrance is the perfect complement to these cultural icons. Like the tireless "Rosies", the even rounded plants of Rosie the Riveter are the workhorse of the garden, producing an arsenal of flowers. Maximum flower power? Yes, we can do it!